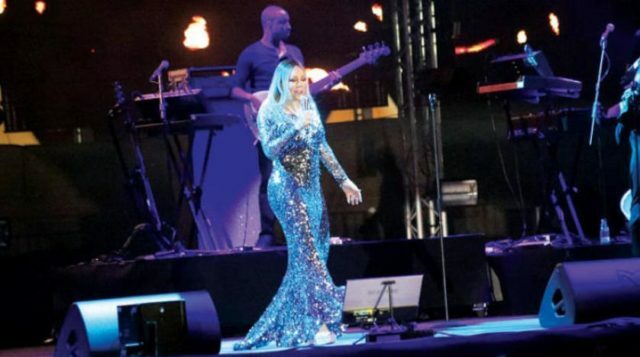 A crowd of 10,000 people showed up to Mariah Carey’s first-ever live performance in Saudi Arabia, held outdoors as part of events planned for the ‘Saudi International’ tournament for professional golfers hosted by the King Abdullah Economic City in northern Jeddah. Considered one of the world’s best-selling pop stars, Carey voiced her pleasure to perform before a crowd in Saudi Arabia. Choosing 18 hot picks from her albums, the New York-born singer swept away an attending mixed gender audience. The opening act, however, was booked for a talented and popular local Saudi DJ that goes by the stage name “Dash” and world-renowned Dutch DJ, Tiesto. The Golf championship kicked off on Thursday at a family-friendly venue featuring performances, entertainment contests, and award-giving ceremonies. Among the events held are the meetings with the golf stars of the tournament. The Saudi Golf Federation has created The Saudi International powered by SBIA – one of the Kingdom’s most significant annual sporting events to date. Its significance is highlighted by the number of world-class athletes participating, global television exposure, luxury hospitality settings, and ultimate spectator experience. The Saudi International will perfectly showcase the Kingdom’s natural beauty, its warm hospitality, and openness for business.